Abstract. Transformations of surfaces allow to construct new (families of) surfaces of the same kind. The concept of transformation is rather far-reaching: for example, the Weierstrass representation of minimal surfaces can be interpreted as a special case. Moreover, discrete (facetted) surfaces of the same kind naturally occur from repeated transformations. 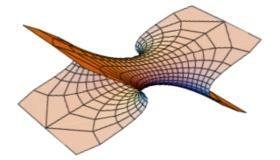 Singularities are, most generally, the "bad points" of a theory, points at which the methods of a theory fail. This already constitutes a strong motivation for their study: the employed methods require extension, the studied objects reconsideration, and new viewpoints on the theory arise. study how those transformations create (or annihilate) singularities, and what the nature of the occurring singularities is. A good understanding of the interplay between transformations and singularities will shed further light on either theory. Moreover, new results and phenomena will arise from this interplay, for example, regarding "singularities" of facetted or paneled surfaces.